I have a dog named Grant. He's a lovely dog, and has been a certified therapy dog since 2007. His favorite thing is having children read aloud to him. He's been at my side for nearly 11 years after coming to me as a 9-week-old puppy. Before his life as a therapy dog, he was once a competition obedience dog. He was even nationally ranked with the American Kennel Club in 2005. He has his Canine Good Citizen Certificate, as well as a Herding Instinct Certificate. He's a very accomplished dog! Despite meeting the breed standard and winning ribbons in conformation at dog shows, Grant is usually identified as a Boxer rather than what he is. He is roughly 45 pounds, quiet, polite, outgoing, and sports a warm, inviting expression. Is he too small and friendly to be a Pit Bull? Those judges who had awarded him ribbons would disagree. Somehow, the words "Pit Bull" have nearly become analogous to "Boogeyman." 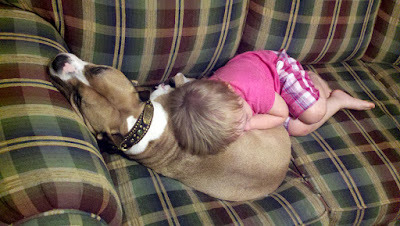 I often wonder what the picture of a Pit Bull is in the mind of the general public. Is it a large, snarling, massive beast? The world's eyes have turned to our little corner of the world due to a high-profile dogfight. James Sak, a disabled former Chicago policeman and Vietnam veteran, was separated from his service dog, Snickers, after the Aurelia, Iowa city council ordered him him to relinquish the dog or risk Snickers being confiscated and killed, despite this being a violation of the Americans with Disabilities Act. Fortunately, a federal judge ruled that Snickers be returned to Sak stating that "the national public interest in enforcement of the ADA "trumps" the more local public interest in public health and safety reflected in the Ordinance prohibiting pit bull dogs within the City of Aurelia." The thing is, there was no reason to remove this dog. Reports say that he has a lovely temperament, and he provides support for his owner. The irrational fear of other people should not be used as a reason to violate another person's civil rights. There is a visceral reaction to the idea of being killed by animals. It is horrifying and something of nightmares. Despite the shocking headlines, it's a very rare occurrence. According to the National Canine Research Council, there have been four dog bite-related fatalities in the state of Iowa since 1965. Different breeds of dogs were reported in each incident. Yet in 2007 alone, 11 people were killed in ATV accidents, 7 people were killed in bicycle accidents, and 4 people drowned in swimming pools. It makes me seriously wonder, why are we not banning ATVs, bicycles, and swimming pools? They are statistically much more likely to cause a fatality, yet we see children utilizing all of the above on a regular basis without adequate supervision or protection. Breed specific legislation usually associated with Pit Bulls, but often extends to other breeds. In Fairfield, Iowa, the dangerous breeds list consists of Doberman Pinschers, Pit Bulls (American Pit Bull Terriers, American Staffordshire Terriers, and Staffordshire Bull Terriers), Rottweilers, German Shepherds, Belgian Malinois, Siberian Huskies, Alaskan Malamutes, and anything over 100 lbs. Think you are immune? How big is your dog? Has a dog of the same breed ever caused a fatality or severe injury? Dachshunds, Pomeranians, Weimaraners, and many other breeds have all fatally injured people. If you go back in time through fatal dog attack records, you see that trends change. The Pit Bull rarely made the list until the late 70s, and German Shepherds, Saint Bernards, Great Danes, and Bloodhounds are all over represented at various times in history. While the fatality numbers per year tend to be static, the breeds represented change due to what is "trendy." Today it is the Pit Bull that is the go-to for anybody wanting Machismo on a Leash. They attract the worst kinds of dog owners. Many shelters around the country, depending on area, report that between 30-80% of their population consists of Pit Bulls. There have been many high profile abuse cases, and there are just a ridiculous number of Pit Bulls out there. But, you never hear about the vast majority of them. Thousands and thousands of them are living the life of a regular dog right now, sleeping on couches or dog beds like the Labradors of the world. 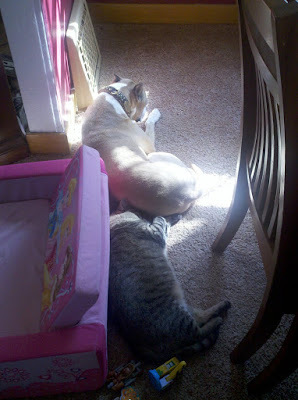 Tomorrow they will go for a walk, eat some dog food, play in the yard, get some attention, and sleep some more. And repeat. You don't hear about these dogs, but they are what make up the vast majority of the breed. Breed bans are failing all over the world. The United Kingdom has passed a bill through the House of Lords that would repeal their infamous Dangerous Dog Act. Why? It costs taxpayers millions, and despite such harsh laws, severe dog bites are on the rise. Scotland Parliament passed a bill to repeal their breed bans in April 2010. In 2008, the Dutch Agriculture Minister abolished the country's 15 year Pit Bull ban because it hadn't led to a reduction in the number of dog attacks. Evidence and research showing the folly of breed specific legislation is readily available, yet it continues. It is expensive and difficult to enforce, and it does nothing to protect the public from dog attacks. In spite of Denver's Pit Bull ban, their rate of dog bite-related hospitalizations is higher than other areas of the state without breed bans. Omaha has also had an increase in dog bites since passing breed specific legislation. The National Animal Control Association, the American Veterinary Medical Association, the Association of Pet Dog Trainers, the Society for the Prevention of Cruelty to Animals, the American Kennel Club, and many other organizations that are actual dog experts are against breed specific legislation. I understand wanting to protect the public. Believe me, I want to protect my own family from harm. But, this is one issue where hysteria is overpowering common sense. We don't have to ban particular breeds of dogs to protect the public. Breed neutral dangerous dog laws have been shown to be successful in reducing dog bites. The animal control bylaws in Calgary, Alberta, Canada have been hugely successful combining pet owner education and enforcement. I encourage you to read The Pit Bull Placebo: The Media, Myths and Politics of Canine Aggression by Karen Delise. The eBook can be downloaded for free at http://www.nationalcanineresearchcouncil.com/publications/ncrc-publications. Or if you prefer a print copy, you can request it through inter-library loan at your local library. Grant and I thank you for being open-minded! Aimee, very well written and factual..something you do not see printed about pit bulls in the newspapers very often. We are proud to have you as part of our family and hope to cotinue to work with the fighting issues of BSL... sadly all through out Iowa. It is time better solutions are brought to the table and if a council is not willing to open their minds to a higher and better solution then it is time to elect new ones! Excellent blog! BSL is just plain stupid. I volunteer at a no-kill shelter here in Pennsylvania and I can tell you that any dog, treated badly enough, is capable of getting on that ill-created list. My husband and I have two cocker spaniels and I've had people ask me why we would ever have such snappy, nasty dogs! We've had 7 cockers in our lives and not one was snappy or nasty! Ok, one snapped at me but I touched him when he was asleep -- my fault totally! It's as simple as nature vs. nurture. If an animal, any animal, is beaten, abused and forced to fight, it will naturally learn that defending itself is the only way to survive. And it doesn't know what human is nice or which one is going to hurt it again so it's first reaction is a defensive one. It's we humans that are to blame. Period. If ALL dog owners would be responsible and keep control of their pets (leashes, appropriate fences, training) There would be no issues, with any breed. What a great piece, I hope u submit it to some papers in your area. As the owner of a lovely, gentil amstaff in Vancouver ,I've noticed the perceptions change about the breed over the last five years.